Maeshowe is little-known, but it should be famous. Before I entered Maeshowe the most impressive megalithic chamber I knew was Newgrange in Ireland, which is famous enough. Maeshowe though is of a different order, it is geometrically symmetrical, Maeshowe is design, architecture, craftmanship. And without compare. Maeshowe can be seen as the first full-born architecture in stone. The difference between architecture and functional construction is that the design prevails over the material in architecture, whereas in the functional construction the aim, the available materials and the whimsical choice of the builder(s) create the form. In the architecture of the Maeshowe (MH-) group on Orkney we can see this crucial development from building only functional to building according to complete design. Vinquoy chamber on Vinquoy Hill overlooking all of Orkney, up to the Hills of Hoy in the far distance, an ideal spot to marvel at the Northern Light, Vinquoy on Eday island, in my view, would be the first chamber which has the characteristics of the MH-group, that is: long low entrance passage, main hall with side cells, high roof which could be opened. But Vinquoy is still rough and functional, while bit by bit the halls and cells subsequently in the other buildings get ‘ rectangular’ until it all comes to be ‘square’ in Maes Howe. 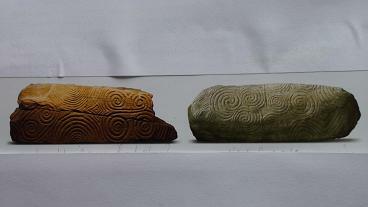 Newgrange in the Boyne valley and Maeshowe on Orkney have some important things in common. There is the long passage and the cruciform design, which already occurs in the hall of Maeshowe but extends into its side cells, there is the roof opening and most of all there is the orientation on the Winter Solstice. The same Sun that rises in the morning through the well-known roof box of Newgrange, sets in the afternoon through the passage of Maeshowe. This, at the Winter Solstice, links the two buildings symbolically and there is strong evidence that the Maeshowe culture on Orkney was culturally related to the Boyne Valley culture, as is clearly shown in the similar motives carved in huge stones in both places (see picture). In the Maeshowe culture the Megalithicum reached new heights and the author claims that in Orkney they were aware of a mathematical model based on natural and rational numbers, that they were indeed aware of the same crucial numerical ratios that went into the architecture of the Great Pyramid, and that these ratios are found in the dimensions of Maeshowe and the stone circles, standing and cut (moats), of Stenness and Brodgar. According to this view the MH- chambers, the circles and the henges, exemplified a geometrical model and served a scientific purpose, not only in charting the night sky to keep the calendar and to measure the time, but also by influencing the weather locally. It is with these eyes that I have looked at the characteristics of the architecture of Maeshowe and then the buttresses in the hall pose a rather big question: why are they there? No other building of the Maeshowe type has buttresses (corner supports), and the corbel construction does not warrant it, on the contrary corbelling should be free from such support. Maybe it was done because they built an exceptionally high roof of up to 6 or 7 meters, which they probably did, and then the buttresses would serve to put a scaffolding on top of it, to facilitate the corbelling. But why make it permanent and why with such huge slabs; they are very present in the hall. The appearance of the buttresses today seemingly supporting the corbelling is in my view due to a wrong restoration, because on an old picture (reconstructed above) it is clear that the top of the right hand buttress was flattened and could carry wooden beams or stone lintels, which would enable the construction of a floor 3m above ground, this flattened west buttress top (see picture above) is exactly level with the on the picture invisible diagonal buttress (east), which is the highest standing stone of all at 2.96m. We see other, even stone built, unique two-storey megalithic chambers in Orkney, so this could well have been the case. I prefer to think though that the buttresses were designed to designate an imaginary cube between their four edges and equally sustain 4 poles, brought and tied together, in one high point, from which crossing point a pendulum would be suspended which had as weight one of the blocks lying before the entrances to the cells today. If such a heavy weight was kept swinging with gentle pushes it would make a circle like the pendulum in the Pantheon in Paris (see picture above). From this they may have concluded in conjunction with the stars passing through their roof window, that the earth was turning on its axis and was a globe. This may seem a wild speculation, but I have taken care to wonder whether it was possible and I think it is. Since the megalithic culture is largely an enigma and the present ‘archaeological’ emphasis on the cult of the dead and its endless ceremonies and rituals, its ever present priests, is running into huge theoretical and credibility problems and because the explanations brought forward are mostly all too artificial if not downright dull, it is time to take a fresh look at the available evidence and rethink the aims of what these builders were doing and why. I simply do not believe that people at these latitudes could afford to put most of their energies into building houses for the dead, while they themselves were living in flimsy huts which could not weather severe storms, incessant rain, nor keep out the winter cold. It just doesn’t make sense. Some people in Orkney recall the storm of february 1953 when they feared for their lives, because there houses were shuddering and shaking on the verge of collapse. That kind of storm on a regular basis, preferably in the cold winter months, with no natural shelter anywhere on Orkney, that may have been the weather condition in the Neolithic for some considerable periods in the fourth millennium. Would people not enter the so-called ‘houses of the dead’ under these circumstances with women, children and babies exposed to severe weather conditions? Of course they would, because the chambers were built for that purpose, they were built to shelter the living, to dry and store their food. Not to bury the dead. That was only a later development, like burials in a church. The function or description of the church does not change because there are some people buried inside. Here it is claimed that the origin of the megalithic chamber lies in its function of shelter and secure storage place for food, that is, an imitation of the cave conditions. It was a communal place, and its essence was in securing the survival of the community. It could very well have been that women gave birth to children in the chambers in the winter, as well as that people died from exhaustion or hunger or cold, when too few were in the chambers or the cold spell too long and, in the latest phases of the chamber use, were left there in the same position as they died, crouched against walls, lying on benches, desiccating quickly in the dry atmosphere. So this picture is a completely different perspective than the presently prevalent scientific paradigm (domineering theory) which brands the chambers as tombs. This prevailing paradigm is bound to undergo a profound shift in the years to come, because it just can’t take in all the known facts (domestic floor dirt in the chambers), without becoming a fairy tale, an ‘anything goes’. ‘An essentially alien culture’ is how Aubrey Burl once characterized the megalithic culture, many others look for explanations in cultural anthropology, but by instead taking the approach of a highly scientific and skillful culture, which acted sensible and understandable given the circumstances, many things do make sense and nothing is necessarily exotic or outlandish, let alone alien, it is rather ‘European’. The death rate of women in child birth was high, and the death rate of babies was probably similar, so there was every reason to do whatever they could to save lives of women and babies and children, they may have lived on the brink of dying out for centuries in the north of Scotland. That was the period which I call the “Neolithic Ice Age”, roughly during the fourth millennium BC (4000-2900BC). It is on the record that around 3800 BC severe storms started to batter the Atlantic coast of Scotland, so that is all the evidence we need. The graphs then show when the worst came to pass, which was around 3400 BC. Megalithic chamber building was in full swing at that time and had spread to the cold countries on the continental North Sea coast, S-Sweden, Denmark, N-Germany, Netherlands. In densely populated neolithic Denmark alone there were a staggering 25,000 megalithic buildings. For the dead? Of course not. Against the cold! Maeshowe was probably built at the end of or after the worst of the cold spell was over, maybe even in a period of relative benign weather, but it still carried the principles of the insulated well drained living space, which did not need heating to retain a good and even temperature, and in it these principles were brought to completion in a masterly way. Maeshowe shows full control over design and realization. 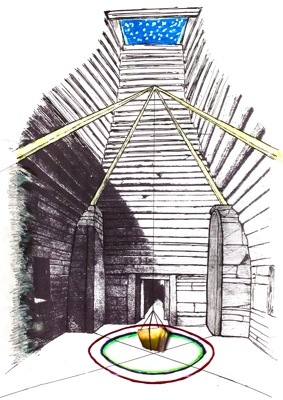 That the roofs of all the Maeshowe type chambers could be opened is very plausible, because the fact was shown at Wideford, where a square opening was in the corbelled roof (50×50 cm) and the possibility is shown at Vinquoy, which was never much higher than it is today, the same as at the Holm of Papay; the architecture of the others is very similar, so this would also make good sense, even if it were not used to gaze at the stars as I prefer to think, because it could work as a chimney, or as an air vent to dry the chamber in the summer from the dampness of the perspiration of considerable numbers of people taking refuge in the winter. It is thus surprising to think that the light falling through roof windows in some restored chambers today (Quoyness, Papay) may be less artificial than it seems, it was on purpose in the design. The roofs of the MH-chambers quite definitely would be opened at specific times, if not most of the summer time, which would give the huge chamber on the Holm of Papay, an early one, the appearance of a souk, an intimate narrow busy street. It is these revolutionary aspects of the construction and architecture of the MH- group, to which also the houses of Skara Brae must be reckoned that set them apart from all other megalithic chambers anywhere in the world at the time. It shows conclusively how much insight, foresight, skill and genius went into these works.